I am an organizer by natural bent. Yup, when you have the gift of administration, organizing tends to be something you are good at, if you put it into practice. 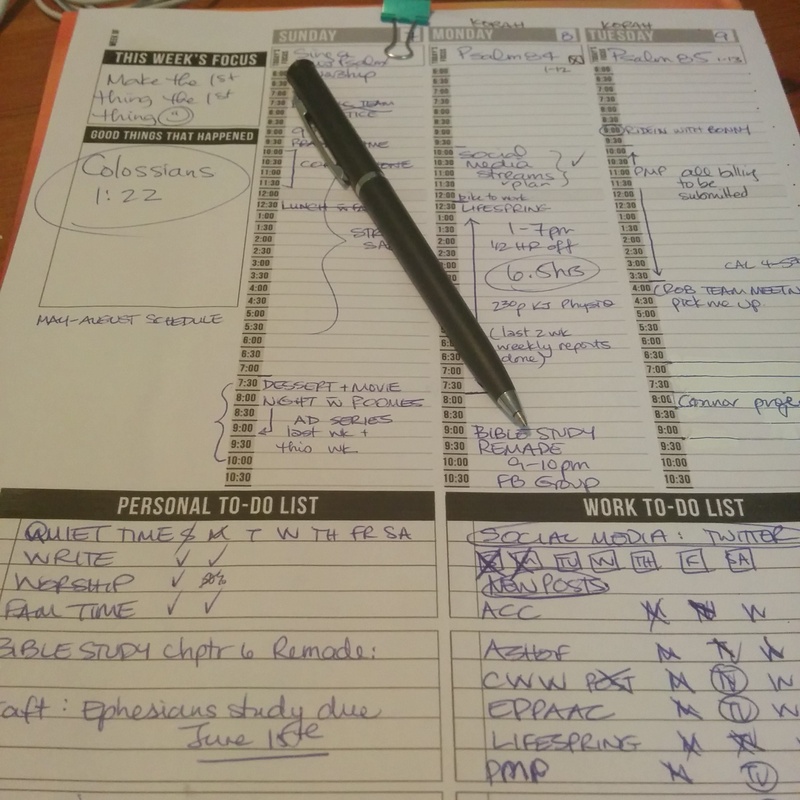 I use an app to track schedules, budget, meals & grocery lists, but nothing quite beats paper for the thrill of crossing things off once they are done. Why do I plan? Besides the fact i somehow can’t help it! A plan is necessary for without goals, we will never get anything started or finished, and allow ourselves to be continuously distracted from what we want to accomplish. Your plan may be to acquire a new habit, track your budget, exercise daily…. If something is important to you you make time to do it. I make sure I allow margin, wiggle room & ask God to help me to be flexible when life happens, as it often does in the blink of an eye to help swerve me off track. But having it down on paper makes it easier to regroup, refocus and follow through. Before you ask ‘How is this related to faith?’, let me answer. God had a plan in mind before He began creation. Every day of creation built upon the precious work He had done, with His pinnacle being making man & woman in His image. And when we fell, He had the plan already in mind which would bring us back to the glory He had designed for us: Jesus. Jesus had one goal in mind that He never swayed from: our salvation. His plan? Love us to the cross, and show how much He loved us before and beyond it. Everything He did, spoke fit within His plan. God knew the only way to bring us back was to hold tight to His plan, despite the physical, emotional & spiritual pain Jesus’ death inflicted on the heart of God. We are to be devoted to Him in the same way, and show His love to all we encounter. Without a plan, deliberate intention to do so, we will fail. My plan, besides my daily agenda, starts with seeking His daily agenda for me. How can I support Him, love my family & family, honor my employers, bless my neighbors, help the needy. How can I become more like Him? I make space everyday for Him. Some days are harder than others with the demands I have in different seasons, but one truth remains. Unless I intentionally pursue Him, all the wishing I may do will never be put into action. When our plans align with His, we can rest assured He will help us bring them to pass, when we desire His glory before our own. We are intentional with our relationships, (marriages, friendships, family, etc) We have to be don’t we? I believe it’s no different with Jesus. Thanks Crystal. Divine margin helps me through the hardest days 🙂 Blessings.